This may be one of the most bizarre loopholes we’ve ever heard of! 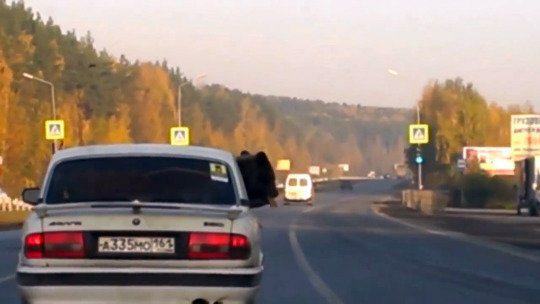 Stunned motorists got the shock of their lives when they spotted the massive beast in the back of the vehicle in Yekaterinburg, Russia (where else? ), last month. Photos and video from the bizarre incident show how the big creature could even be seen poking its head out of the window like an overjoyed dog on its first drive. Although Moscow’s Filatov Circus was in town at the time of the incident, they later confirmed that the bear was nothing to do with them. Our bears are much bigger. Normally little bears are kind and friendly. If it was more than a year old it wouldn’t have fit in such a car and certainly wouldn’t have gone inside happily. Other zoos have also denied any knowledge about the animal. So, basically, some guy in Russia has a pet bear. Because of course he does. 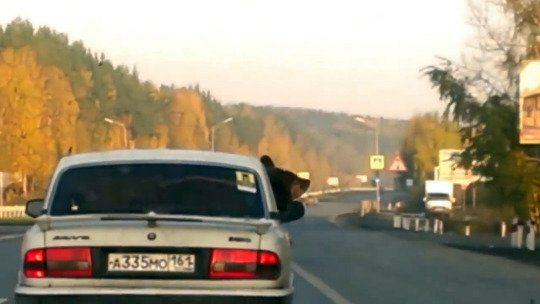 Local police confirmed it was not illegal to transport bears in this way, as long as they wore a seatbelt, in accordance with Russian road traffic laws. We reckon this is an issue which wouldn’t come up anywhere else in the world, to be honest!